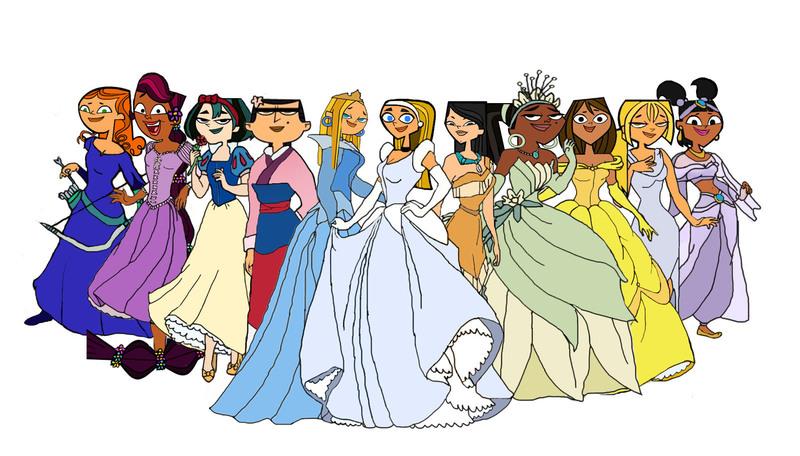 Disney Total Drama Princess. Most of the Females in Total Drama are playing as their favourite Disney Princesses.. HD Wallpaper and background images in the Total Drama Island club tagged: total drama island tdi disney princess. Izzy as Merida [Disney Pixar Brave (upcoming)]: because both have tangled red hair and both have a Scottish background. Sierra as Rapunzel [Tangled]: they both have long hair, and are highly talented in arts and crafts and they both act quite similar, especially when they are both excited. Gwen as Snow White [Snow White and the 7 Dwarfs]: they both look similar really, both have fair skin and short black hair. Blaineley as Aurora [Sleeping Beauty]: Just because of looks really and I didn’t want her as Cinderella. Lindsay as Cinderella [Cinderella]: They both look similar and are both kind hearted girls. Heather as Pocahontas [Pocahontas]: They both have long black hair that flows with the wind, and they act quite similar when they are both angry. Leshawna as Tiana [the Princess and the Frog]: Both have an African background and they speak in the same slang and they both act similar when they’re telling someone off. Bridgette as Ariel [the Little Mermaid]: I would see Bridgette liking Ariel because Bridgette’s a surfer I would see her liking mermaids when she was a little girl. Katie as Jasmine [Aladdin]: I just wanted her as Jasmine. i think they all match but whos merida???? Merida is an Upcoming Disney Pixar fim called "Brave" that will hit cinemas in 2012. Brave is a story of Merida a Scottish princess who doesn't want to be a princess an would rather spend her time doing archery and in the movie Merida fights dark forces with a bear as a companion. The movie "Brave" was originally called "the Bear and the Bow"
i think heather would be a better mulan, scince that they look exactly alike! wow you have quite the (like they say on spongebob) IMAGINATION! I've decided to change some of the girls of Disney Princess. After seeing Dawn/Zoey (whatever the girl in the green sweater name is) I think she would make a better Princess Aurora than Blaineley. I still say Heather makes a better Mulan and Katie looks more like Pocahontas. And Dawn is the one in the green sweater; Zoey has short red hair with a flower in it.